George’s grandma is a grizzly old grunion who loves to crunch on foul slugs and bugs. 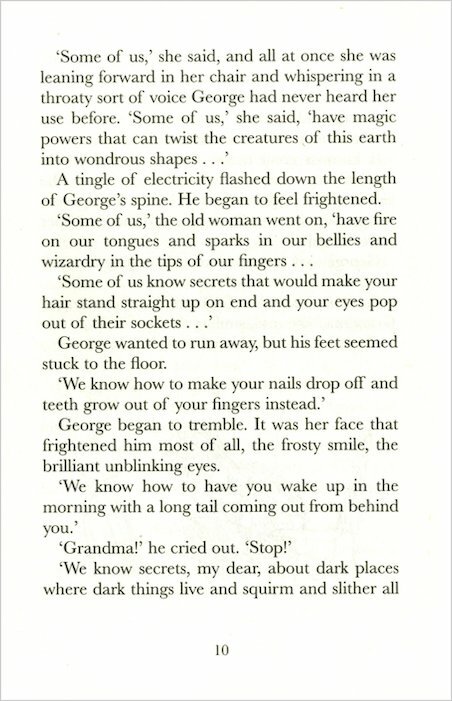 As if bullying her young grandson wasn’t nasty enough, she also likes to threaten George with unnatural magic. So one day, when it’s time for Gran’s medicine, he gives her a dose of his own special brew… As Granny sizzles and swizzles and shoots through the roof, the scene is set for a story which fizzes and crackles with magic! If you love fiction, magic and humour this is the book for you. I liked it. i loved the book because i loved the part when grandma goes very tall, when the chicken goes tall and when the father rushes George to make Marvelous Medicine two. This is a great book and very witty too. The weird effects of George’s medicine are so cool. I like it when granny grows huge. 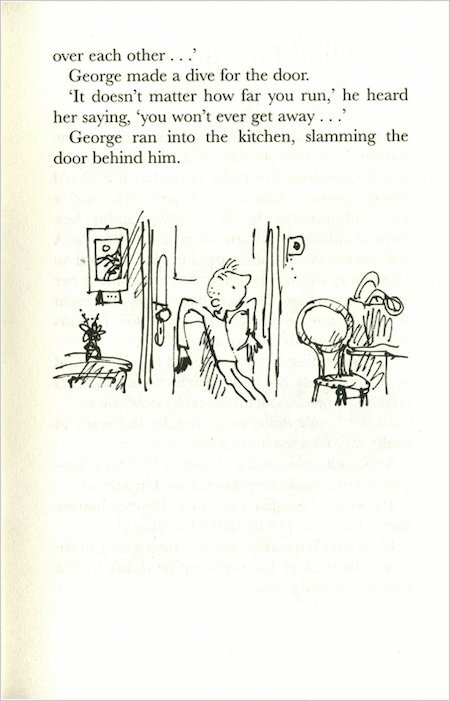 This is my favourite book by roald dahl because it ks interesting and easy to read and understand. Great book I adore this book lots. I thought this book was hilarious and fantastic. George is my favourite character because he is brave and creative. 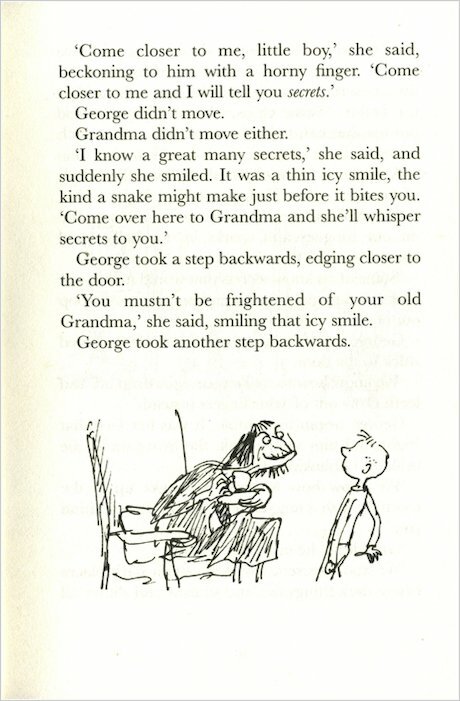 I would recommend any of Roald Dahl’s books because I am always sat on the edge of my seat and you will be too. AHH LOVE THIS BOOK SO MUCH. GEORGE YOUR SO FUNNY I THINK IT WAS A GOOD IDEA FOR GEORGE TO MAKE UP THE MARVELOUS MEDICINE. IF MY GRANDMA WAS CRUEL LIKE THAT I WOULD BE DOING THE SAME. George does not like his grandma so he makes her some special medicine. this is a good book its brillllll! this is an excellent book! lots of different feelings coming and going in different parts of the book, is what makes it so unbelievably great! I’ve got this book!!!!!!! SOOOOO FUUUUNNNNNNNNNNYYYYYYYYYYYYYYYYYYYYYYYY!!!!!!!!!!!! I think this book was marvellous! 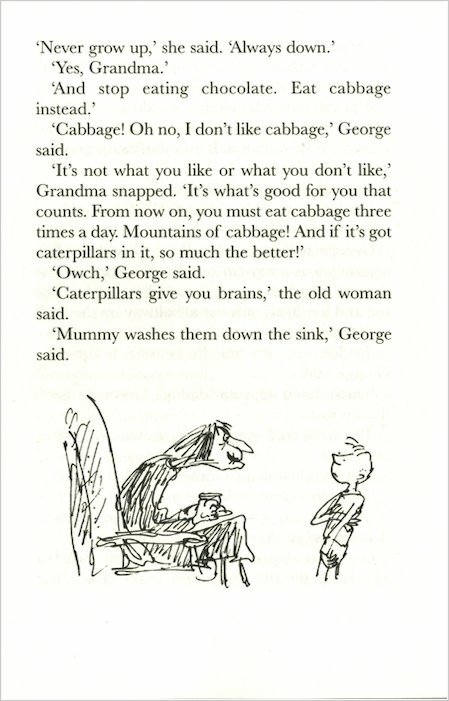 I loved when George made the medicine so deviously. Serves her right, I think! * * * *! i found this story very entertaining! i loved all the characters! 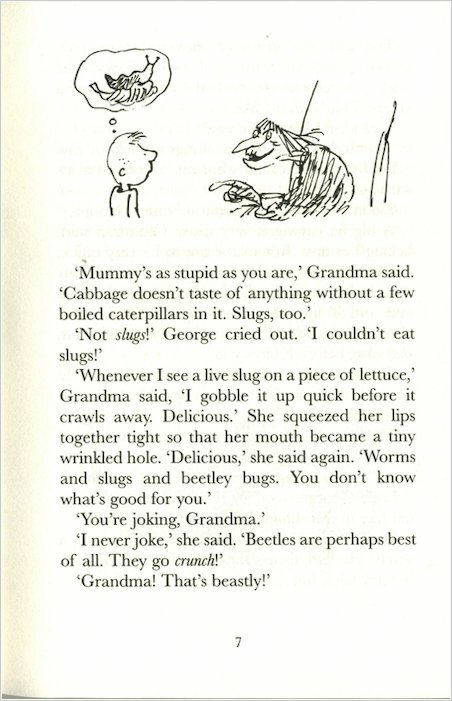 I read this when i was younger and again when I was a little older, and had completely forgotten how great it was. My favourite part is the concoction of the medicine, the descriptives are just fantastic, and I loved it, just loved it. I think any child would enjoy it, because it’s short, but packs so much detail into the pages, that your brain will be filled with marvellous ideas by the end. i sooo want to make that medicene but NOT GIVE IT TO MY GRANNY!!!!!! 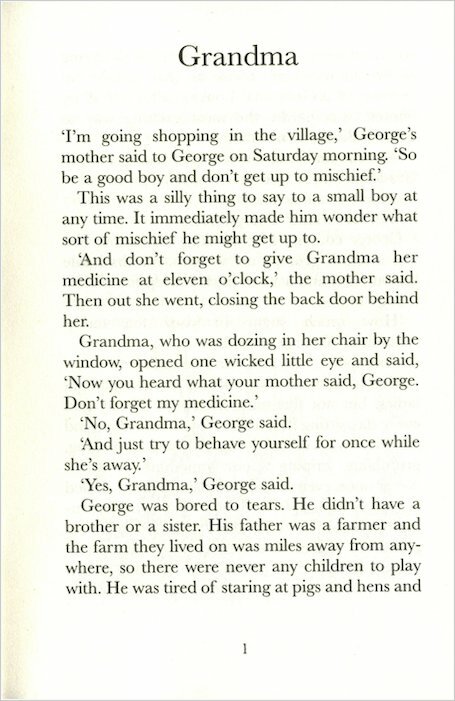 I loved this book because it was about a boy who absolotley hated his grandma and his grandma had said to him to get him her medicine.This was when George’s imagination became to come alomg. He mixed anything he could find and made his own medicine. Once he had given the medicine to his grandma she was taller and she had broken the roof of the house! this book is fantastic and i could read it again and again to get lots of good ideas. I loved it! it was the kind of book that you had to read 1000 times! it was perfect! I was shocked of a interesting the book was that i read it 5 times!!!!!!!!!!!!!!!!!!!!!!!! it’s a really good book and quite shocking!! it is the bes book. i never put it down. in bed i was reading it. A great book! I loved it and that Grandma actually drank the medicine. I loved the description of what George actually put in the medicine. Has been read many times and is a great classic. This book is great. 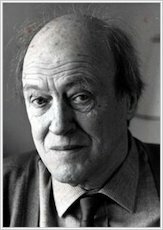 It is really funny thanks to all the crazy ideas that Roald Dahl came up with. 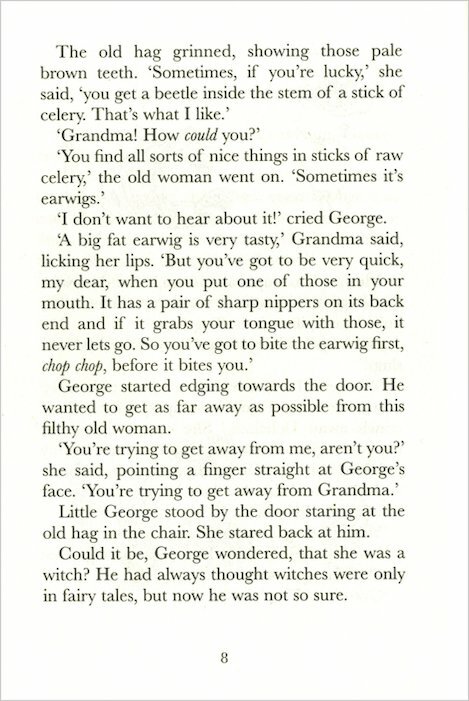 It made me giggle at least 100 times when I read it, joyful and fun, the grandma changing height and the chicken was funny! 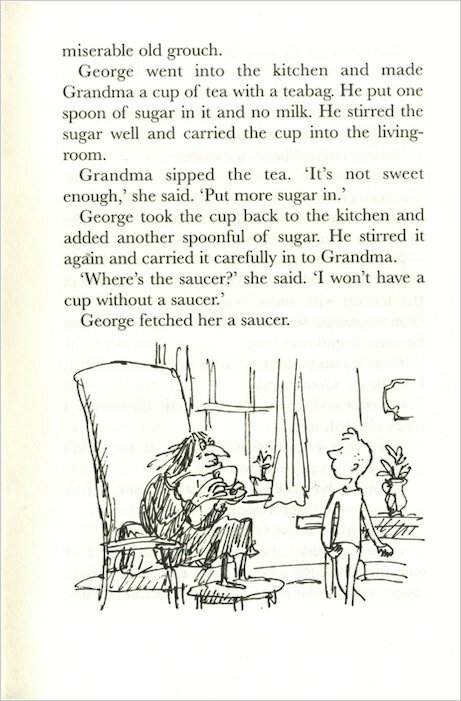 It was funny that George made different medicine for grandma, and made her realy tall. That was realy funny! i loved this book!expecially the part when the grandma became as tall as a house and when the chicken became a giant chicken! 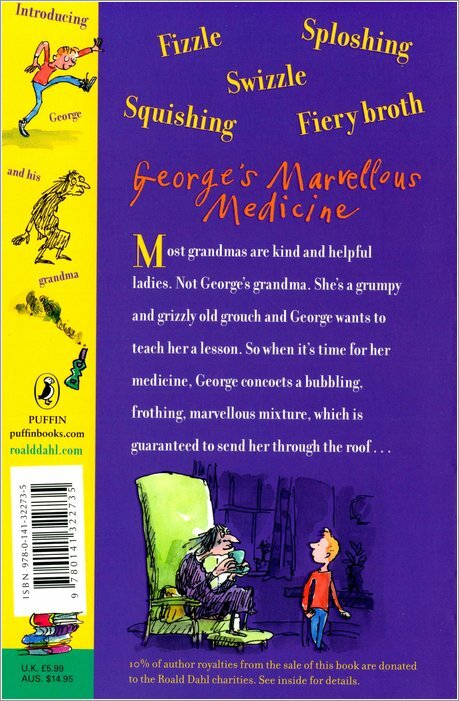 read this george’s marvellous medicine book it will really make you laugh!ha ha! It’s Marvellous!!! I liked it when she shrunk i sure wouldn’t like her as my grandmother. I loved it It was very funny and i loved it when his grandma shrinked!!!!!!!!!!!!!!! This book is fantastic. George and his Grandma and his parents live in the farm. George doe not like his Grandma because shes old and not fun and horrible and lazy. Then George decides to make a medicine and he puts in the medicine animal pills and kitchen food and his mums make up. Then he gives his medicine to his Grandma. 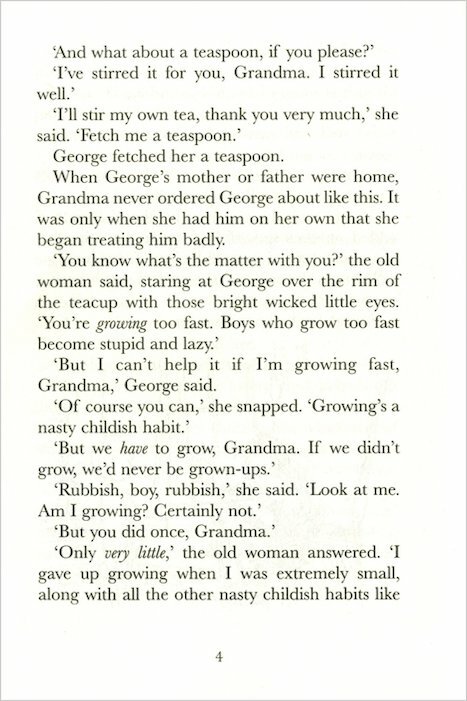 George Grandma grows tall and then george starts to give the medicine to the animals and they grew tall also. Roald Dahl is an amazing writer I have nearly read all of his books now. 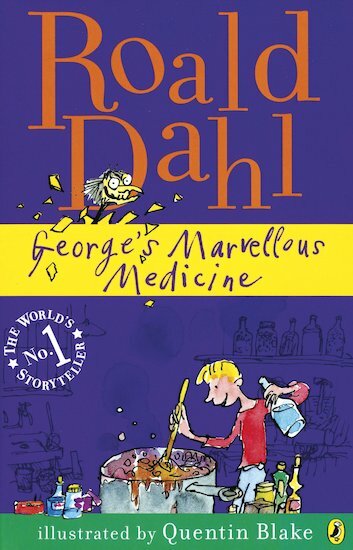 George’s Marvellous Medicine was one of my favourites. 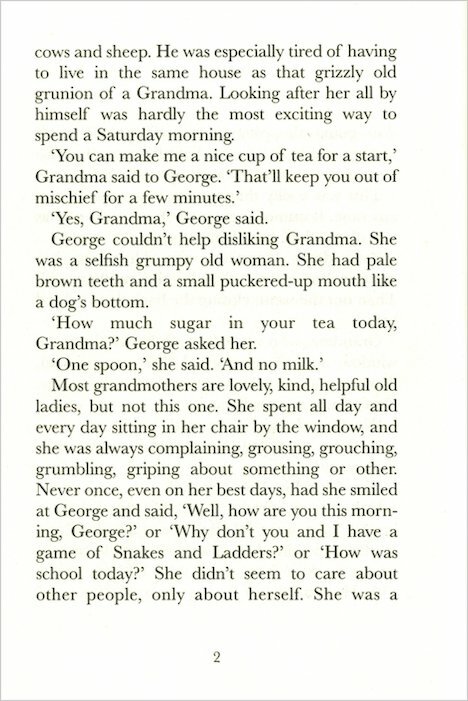 My favourite part was the very last bit when the Grandma has the medicine and she grows and grows but then again I do not really have a favourite bit because I loved the WHOLE BOOK! I loved this book because it was really funny. It was also very interesting and eye-catching! I think lots of people, adults and children will like this book as much as I did. I also love Roald Dahl’s books. This is an OK book. But if you are looking fo humourous books READ THIS. I loved Georges mavellous medicine because of the great plan! I am reading this at the moment, really funny,lovin it so far! This book was absolutly helarious and when i was reading it i had to stop my sides from spliting!! 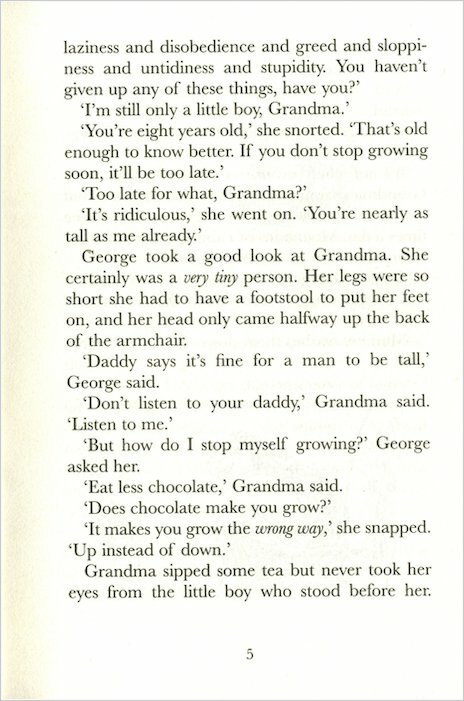 i dont want to give the book away but the most funniest bit is when grandma grows and then gets shrunk!! I would of hated her to be my grandma!! :( i would run away !! :) btw do you know if george goes to school or is he to poor too? ?